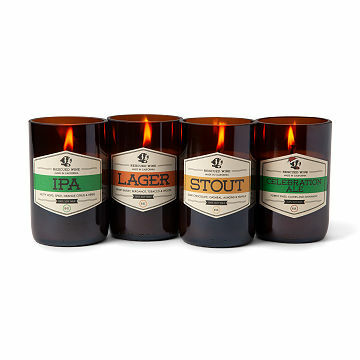 Craig Davis scents his beer-inspired soy wax candles like a master brewer flavoring his signature suds. If craft beer is the light of his life, Craig Davis's handcrafted candles are made for him. Craig blends the long-lasting soy wax bases with cheery, beery, all-natural scents, and pours them into hand-cut, reclaimed bottles. Hand poured in Truckee, California. IPA: Nutty hops, spice, orange citrus, and herbs. Lager: Sweet barley, bergamot, tobacco, and woods. Stout: Dark chocolate, oatmeal, almond, and vanilla. Craig Davies has two favorite things in life: The calming power of candles, and his rescue dogs, Coco and Vino. So, when it came to starting his candle business, he knew two things: He would never work with ingredients that harm animals, and he would use his success to support animal rescue. Five years after rolling out his first collection, Craig has successfully worked with and raised money for shelters in his home state of California. His designs feature blissful scents like our cocktail-inspired candles, are made from 100% soy wax—causing no harm to any creatures—and poured into reclaimed glass. As you light your candle and enjoy the delightful fragrance, you’ll know our furry friends are also being looked after. Love the quality and price and that Uncommon Goods offers something different the norm. Love everything about the candle and so did the person I gifted it to. Scent is amazing and I loved the fact that they reuse bottles and donate to charitable cause. Incredible smell. Great for every day use. It's a gift so I don't know how it burns, but it smells nice. I appreciate the effort and craftsmanship that went into the design. Beautifully cut bottle and nice labels, excellent packaging, but the delivery falls flat. It does not smell like beer let alone an IPA. The fragrance is dominated by orange scent. While it is pleasant, for the $26 price point, I fully expect a quality product. Would not purchase again. I got the Stout candle and it smells amazing! I got it for my boyfriend, lover of beer and candles! Also shipped and delivered very quick.